Check out weeks 1&2, 3&4, and 5&6 here! It’s getting harder and harder to remember everything that happens over the course of two weeks. 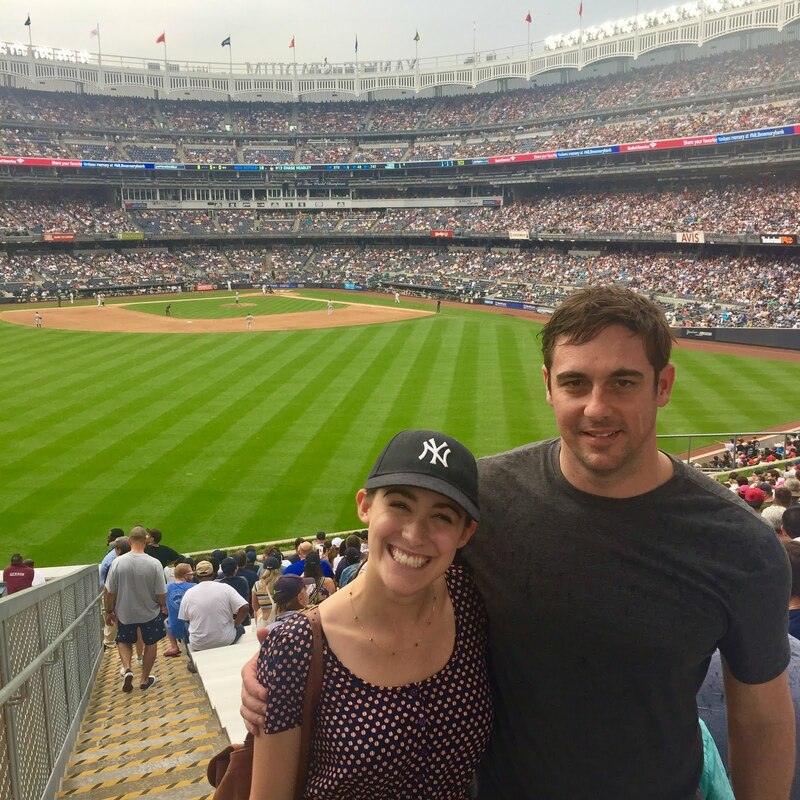 From client site visits, to Yankee Stadium, to making my way over to the newest IBM co-working space in the city, there was a lot of movement these past two weeks. At the start of last week, I spent the day at a client site where I had the opportunity to sit in on a weekly planning session and a call about a Watson conversation tool. Despite all my reading and learning about our Watson solutions, I continue to find out about new offerings and was especially excited to hear about Watson Workspace, which is a collaboration tool. My favorite aspect is that if you are away from a conversation for any length of time you can quickly browse the highlights of what you missed, as compiled by Watson, eliminating the need to shift through messages to find what is relevant. I don’t know about you, but trying to make my way through the banter and chit chat of group messages to find what is actually important can be such a headache. This tool also has the ability to integrate with other apps, share files, and all that jazz. I get completely psyched when I hear about the ways cognitive technology is being implemented across the board! The rest of the week was chiefly dedicated to working on the next Global Sales School challenge that focuses on developing a proposal. We had to create documents with extensive information on a proposed solution, benefits to the client, and show how we have had success in the past. Working with other summits (new sellers in my program) from across the country is fun and challenging. Coordinating work over conference calls and shared Box folders isn’t the easiest, but I absolutely love the team I get to work with (you'll remember from the last post that we are great at working together on complex projects like building a bridge out of paper and cups). We are going to present our work virtually next week (wish us luck) and then it’s on to prepping for the next challenge. A highlight from last week was going as a group to Yankee Stadium for a game. 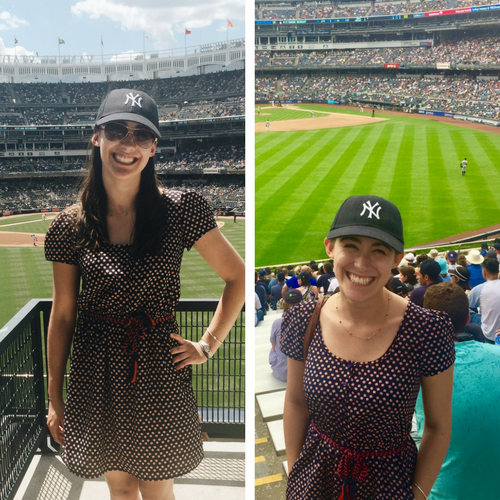 This was also an activity last summer when I was an intern and I purposely wore the same hat and outfit, just so I could put these photos side by side in this post. Two notable items: 1. I love how you can tell how my photo editing style has changed. Last year I was all about cool, vintage-type tones, and now I can't get enough of saturated color. 2. I am not bald this year, I just put my hair back in a ponytail. I know everyone was concerned about that, so I wanted to put your mind at ease that I have not in fact taken a major fashion plunge that I would inevitably and immediately regret. Although it was rainy most of the time, I enjoyed socializing with everyone outside of the office. Also, this is a special shout out to Jesse, one of the summits I interned with last summer, who is moving to Florida after the end of the program because he is working with an awesome client down there. We (read: me) are going to miss you! 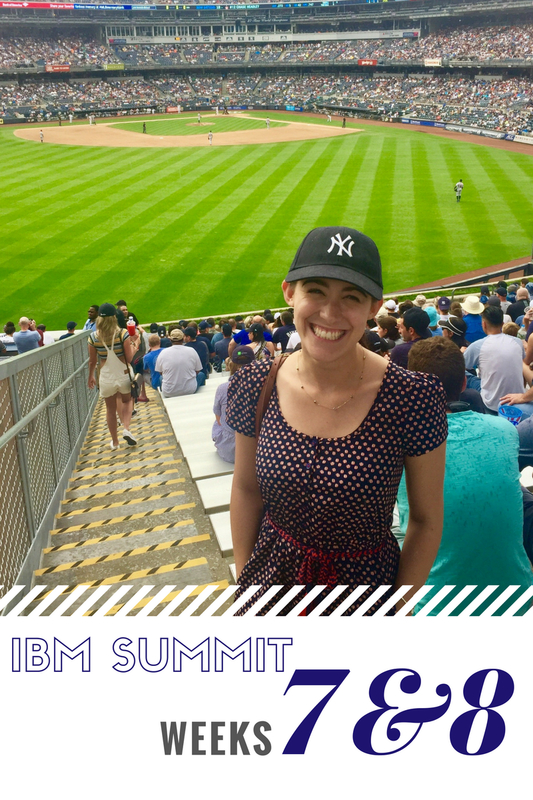 As I’ve mentioned in other posts (if you want to get caught up, you can read the rest here), I spend quite a bit of time meeting other IBMers and learning everything I can about the areas of the business that most interest me. This past week I have been scheduling calls and connecting with others. I am continually impressed with the people I meet and how willing they are to talk to me and be helpful as I navigate the start of my career. Last summer I prided myself on the fact that I visited all of the IBM offices in the city, but when I returned this year a new WeWork (a super awesome co-working space, with all of the amenities you could want. Mouthwash in the bathroom? Yes. Never ending supply of coffee and snacks? You bet.) had been added for the marketing team down near Union Square. This week I checked going to the new office off my list (in fact, I went there twice because it’s such a cool space). The first time was to meet with a group that plans events for women at IBM. 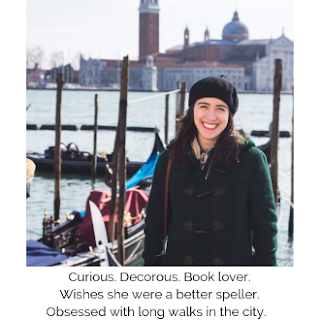 I continually seek out ways of getting to know people across IBM in other job functions because I learn so much more about the company and what’s going on! The second time I headed back to hear Rob Thomas, the GM of Analytics, talk about IBM’s “One Architecture” and how we are developing simplified solutions to deliver maximum value. After that, I got together with a woman from marketing I met on Monday to learn more about the research she does that is created in part to support sellers. It was interesting to hear about the process and projects she focuses on to enable some of the work that I do. Another fun part of my week was seeing my friend Dan, who is a seller up in Boston and also went to The College of New Jersey. He invited me to join his quarterly business review where he presented to his managers and team the deals he is currently working on. He prepared me for the worst and claimed that he was going to get beaten up, but that was not the case at all! Seeing how they strategize and help one another to plan was great and gave me a better idea of what to expect once I am the one up there. One of my favorite parts of this past week was helping other summits prepare for their first Global Sales School role plays. Not only do I love helping colleagues out, but when it has to do with mock sales calls I am all over it. A combination of technology, acting, and asking another person a million questions is literally my dream activity. Lastly, I worked on a variety of courses and webinars to continue my IBM education. I’ve also been talking to sellers to identify ways I can assist their teams. I anticipate that the next two weeks will be filled with preparations for my upcoming set of role plays and continuing to get involved with in-territory experiences. Two months down, four to go!